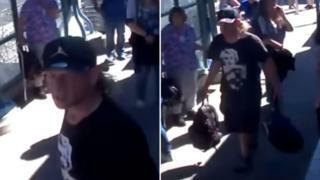 Police are searching for a man they suspect of stealing a bag and wedding ring from one the victims in the Portland train stabbing. Army veteran Ricky Best, 53, was killed when he intervened to protect two young women from anti-Muslim abuse last week. Mr Best and fellow victim Taliesin Myrddin Namkai-Meche have been widely hailed as "heroes" for their actions. Officers said the backpack contained "personal items important to the Best family". The department's official spokesman, Sgt Pete Simpson, tweeted: "Find this man Portland. This family has already suffered too much pain." Sgt Simpson told Portland's KOIN-6 television: "We really kind of want to lean on the humanity if there is any there." "Turn yourself in, bring the property back so this family can have it," he said in an appeal to the thief. 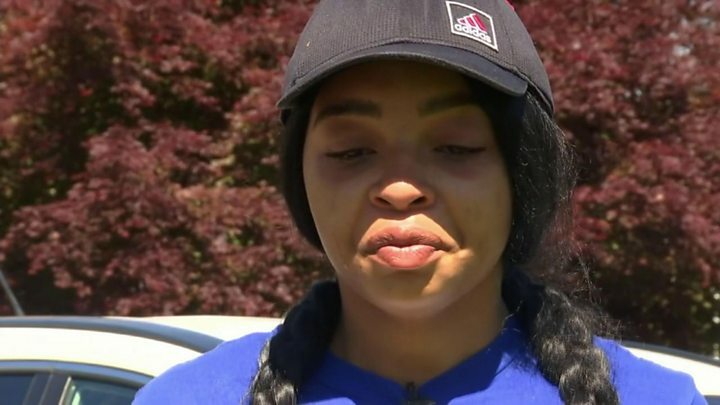 The attack happened on 28 May on Portland's Max train, when a man began shouting "hate speech" at two young women on the train, one of whom was wearing a hijab. When passengers attempted to intervene to protect the pair, the man produced a knife and stabbed three people, killing two. One of the two women, 16-year-old Destinee Mangum, said: "Without them, we probably would be dead right now." Jeremy Joseph Christian, 35, has been charged with murder, attempted murder, possession of a weapon and intimidation. During a brief court appearance on Tuesday, he made no plea, but instead shouted slogans such as: "You call it terrorism. I call it patriotism" and "death to the enemies of America". He is due to appear in court again on 7 June.